Saint Rocco's Feast | Who Is Saint Rocco? Saint Rocco was born of noble parentage about 1340 A.D. in Montpellier, France. At birth it was noted that he had a red cross-shaped birthmark on the left side of his chest. As a young child, San Rocco showed great devotion to God and the Blessed mother. At an early age, his parents died leaving him an orphan under the care of his uncle, the Duke of Montpellier. Soon after, San Rocco distributed his wealth among the poor and took a vow of poverty. 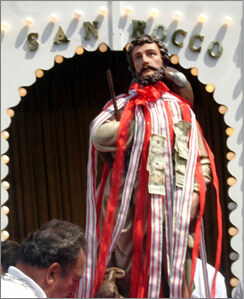 San Rocco dressed in the clothes of a pilgrim and departed for Rome. At that time, Italy was stricken with a rampant disease. San Rocco cured many of this dreaded disease by praying for them and making the sign of the cross. During his travels, he too contracted the plague which was evident by an open sore on his leg. Rocco was banished from the city and took refuge in a cave. Here he slept on leaves and drank water from a small stream. Miraculously a dog that refused to eat, faithfully brought him bread as a means of sustenance. The dog used to leave a nearby castle and the Lord of this castle having a curious nature followed this dog into the woods and discovered Rocco. The nobleman had pity on Rocco and brought him to his castle where Rocco was cured. San Rocco traveled through northern Italy for two or three more years before returning to his birthplace in France. So weak and sick from suffering, the townspeople did not recognize him and he was thrown into jail as a spy without any proof. But yet he was kept in prison for five years. On August 16, 1378, a guard entered his cell and found San Rocco near death. The dungeon was illuminated with a blue light radiating from his body. Upon hearing this, the Governor demanded to know San Rocco's identity. San Rocco faintly replied, I am your nephew Rocco. Only one thing could prove that, so he had him disrobed and the red cross-like mark was visible on the left side of his chest. The Governor and the townspeople present in the cell then believed. A voice from paradise was heard announcing that San Rocco's soul had merited immortal glory in Heaven. Even after his death, San Rocco performed many miracles. Saint Rocco is venerated in the Roman Catholic Church as the protector against the plague and all contagious diseases. The statue of Saint Rocco is considered unique among theologians because of his pose. It is most unusual because it depicts him with his left hand pointing to an open sore on his left leg. Few images of saints expose any afflictions or handicaps. His body is enclosed in a glass tomb in the church of San Rocco in Venice, Italy. We commemorate the death of this great follower of Christ on August 16th of each year. Saint Rocco, still very young, You left your home and all your possessions and you went on your way! Thank You! By your example, may we learn to free ourselves from a need for comfort and money, and especially from all spirit of greed. Pray for us! Saint Rocco, you left in search of the living God, on a road filled with risks! Thank You! By your example, may we follow our path to God each day without fear of obstacles. Pray for us! Saint Rocco, while following the footsteps of Christ, you found the poor and the plague stricken. And you cured many. Thank You! By your example, may our heart become tender and loving toward the suffering, the rejected of this world. And may they feel free of their illness! Pray for us! Saint Rocco, at Rome, you wanted to find your Christian roots again and to restate your fidelity to the Church. Thank You! By your example, may we not be weak members of the people of God but rather bright and active Christians. Pray for us! Saint Rocco, for five long years, you shared the Passion of Christ, His unjust condemnation, His feeling of abandonment. You offered Your life with a love without blemish Thank You! By your example may we bear adversity without hate, without bitterness and without doubting God Pray for us! Saint Rocco you have reached the Kingdom of peace, joy and friendship Help us to reach it too with all those that we carry in our heart. Pray for us!